"I will establish My covenant with you; . . . neither shall there any more be a flood to destroy the earth. . . . I do set My bow in the cloud, and it shall be for a token of a covenant between Me and the earth." At last an angel descended from heaven, opened the massive door, and bade the patriarch and his household go forth upon the earth and take with them every living thing. In the joy of their release Noah did not forget Him by whose gracious care they had been preserved. His first act after leaving the ark was [p. 106] to build an altar and offer from every kind of clean beast and fowl a sacrifice, thus manifesting his gratitude to God for deliverance and his faith in Christ, the great sacrifice. This offering was pleasing to the Lord; and a blessing resulted, not only to the patriarch and his family, but to all who should live upon the earth. "The Lord smelled a sweet savor; and the Lord said in His heart, I will not again curse the ground any more for man's sake. . . . While the earth remaineth, seedtime and harvest, and cold and heat, and summer and winter, and day and night shall not cease." Here was a lesson for all succeeding generations. Noah had come forth upon a desolate earth, but before preparing a house for himself he built an altar to God. His stock of cattle was small, and had been preserved at great expense; yet he cheerfully gave a part to the Lord as an acknowledgment that all was His. In like manner it should be our first care to render our freewill offerings to God. Every manifestation of His mercy and love toward us should be gratefully acknowledged, both by acts of devotion and by gifts to His cause. How great the condescension of God and His compassion for His erring creatures in thus placing the beautiful rainbow in the clouds as a token of His covenant with men! The Lord declares that when He looks upon the bow, He will remember His covenant. This does not imply that He would ever forget; but He speaks to us in our own language, that we may better understand Him. 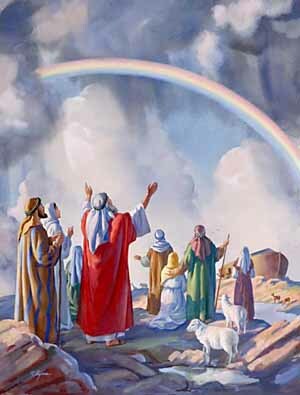 It was God's purpose that as the children of after generations should ask the meaning of the glorious arch which spans the heavens, their parents should repeat the story of the Flood, and tell them that the Most High had bended the bow and placed it in the clouds as an assurance that the waters should never again overflow the earth. Thus from generation to generation [p. 107] it would testify of divine love to man and would strengthen his confidence in God. The entire surface of the earth was changed at the Flood. A third dreadful curse rested upon it in consequence of sin. As the water began to subside, the hills and mountains were surrounded [p. 108] by a vast, turbid sea, Everywhere were strewn the dead bodies of men and beasts. The Lord would not permit these to remain to decompose and pollute the air, therefore He made of the earth a vast burial ground. A violent wind which was caused to blow for the purpose of drying up the waters, moved them with great force, in some instances even carrying away the tops of the mountains and heaping up trees, rocks, and earth above the bodies of the dead. By the same means the silver and gold, the choice wood and precious stones, which had enriched and adorned the world before the Flood, and which the inhabitants had idolized, were concealed from the sight and search of men, the violent action of the waters piling earth and rocks upon these treasures, and in some cases even forming mountains above them. God saw that the more He enriched and prospered sinful men, the more they would corrupt their ways before Him. The treasures that should have led them to glorify the bountiful Giver had been worshiped, while God had been dishonored and despised. At this time immense forests were buried. These have since been changed to coal, forming the extensive coal beds that now exist, and also yielding large quantities of oil. The coal and oil frequently ignite and burn beneath the surface of the earth. Thus rocks are heated, limestone is burned, and iron ore melted. The action of the water upon the lime adds fury to the intense heat, and causes earthquakes, volcanoes, and fiery issues. As the fire and water come in contact with ledges of rock and ore, there are heavy explosions underground, which sound like muffled thunder. The air is hot and suffocating. Volcanic eruptions follow; and these often failing to give sufficient vent to [p. 109] the heated elements, the earth itself is convulsed, the ground heaves and swells like the waves of the sea, great fissures appear, and sometimes cities, villages, and burning mountains are swallowed up. These wonderful manifestations will be more and more frequent and terrible just before the second coming of Christ and the end of the world, as signs of its speedy destruction. Click here to read the next chapter: "The Literal Week"